Home » How Do You Maintain a First Aid Kit? How Do You Maintain a First Aid Kit? Once you purchase a first aid kit, you just find a place for it and don’t give it a second thought. You hope for the best and hope that you will never need it. But, there is an expiry date on many first aid supplies. If the first aid kit is not maintained, it can be useless in the case of an emergency. Choose two dates a year when you check your first aid kits. Replace all the supplies that are close to the expiry date. Check that all the contents and supplies are in stock. Check that the sterile products are still uncompromised and sealed. Only by regularly checking your first aid kits can you be certain that they are always ready to use. It is just a matter of habit. Also, your employees all need to know where the first aid kit is and what it contains. Not all of them need to know how to administer the first aid, but it is advisable that you have at least one of them who is a certified first aider. First Aid kits help save lives. They are the first step toward getting real medical assistance in case of emergency. Therefore, their maintenance cannot be emphasised enough. However, it is easy to forget about it and business owners usually don’t have the time to deal with it. Alsco NZ has the answer. Our rental program helps you in two ways: first, you don’t have to pay a lot of money upfront to buy first aids and secondly, once you rent first aid kits from Alsco NZ, regular maintenance by our professionals is included in your annual rate. Get maintained first aid kits for your workplace. These are just general items that can be found in a basic first aid kit that is appropriate for an average workplace with no special risks. This is a first aid kit that will work well in a school office, retail shops even a restaurant. Better prevent than cure, right? In addition to keeping your first aid kits properly stocked and regularly maintained, especially if you work in a school, learn how to create a safe and healthy environment to minimise the risk of accidents. This School Washroom Guide can be your starting point. However, the first aid kit contents can and should be adjusted to specific workplace requirements. Here are some more details about the contents of the first aid kit. Instructions – Not everybody works well under the pressure of an emergency situation. Even if they know a thing or two about first aid, the adrenaline can render them flustered and unable to remember what to do. That is why you need first aid instructions, written in brief and concise directions. 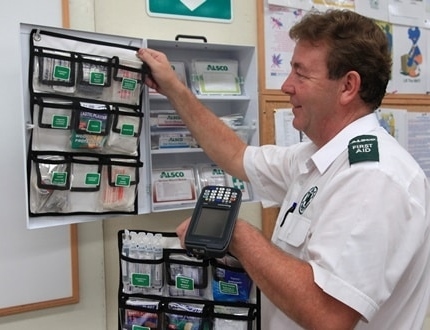 First aider phone numbers – The phone numbers of first aiders can be useful to get in touch with them for advice or to call them if they are within the facilities. Saline solution and wet wipes – Wet, sterile and packed one by one. That is how you want your wipes to be. They are needed for wiping your hands and similar activities in case that there is no running water nearby. The saline solution has a similar purpose, but it is usually used to disinfect the wound so it can be properly dressed. Adhesive dressings – these supplies make sure that your dressing of the wound stays in place. They are excellent for cuts and slits. You need them in different shapes and sizes and the minimum is 20 pieces of individually packed dressings. Bandages and eye pads – two stretch bandages come in handy in cases of bleeding that needs to be contained and compressed. Regular ones have their use, as well. It is best to have two of each kind. Also, eye pads are specially formed types of bandages that serve to protect the hurt eye from possible infections. All these supplies need to be sterile. Wound dressings – you use bandages to keep the wound dressings in place. That is why they need to be sterile and unmedicated. They are what comes in contact with the wound, so if they are not sterile, there is a good chance that the wound will be infected. You cannot predict the wounds, so you need to be prepared. The most commonly picked sizes are 12 cm x 12 cm and 18 cm x 18 cm. Keep the stock of 6 smaller dressings and 2 big ones. Clasps and safety pins – the wound dressings provide protection for the wound and the bandages keep them fixed, but what makes the bandage stick? That is where the clasps and the safety pins come. They are needed to attach the bandages and other first aid supplies. Resuscitation mask – it is not always sanitary and/or safe to give mouth-to-mouth to an unconscious person. That is why you should use a resuscitation mask. It contains filters that prevent viruses and bacteria to get transferred from one person to another during CPR. Different small tools – the use of scissors is obvious. You need to open the packages and tailor the bandages in some situations. Tweezers are irreplaceable when you need to remove foreign objects from eyes or ears. It is challenging to worry about every little thing in your first aid kit. But, Alsco NZ doesn’t mind. We will put this and anything else you may need into your workplace first aid kits. Moreover, we will visit you regularly to check if anything needs replacing or restocking. It is all the safety and none the worry with Alsco New Zealand. Get your customised first aid kits to keep your employees safe.